Looking for something different, I ventured into VG Liquors in Lawnside, NJ and found the Old Court Ale (a dark pale ale) among several offerings from the 16 Mile Brewery. 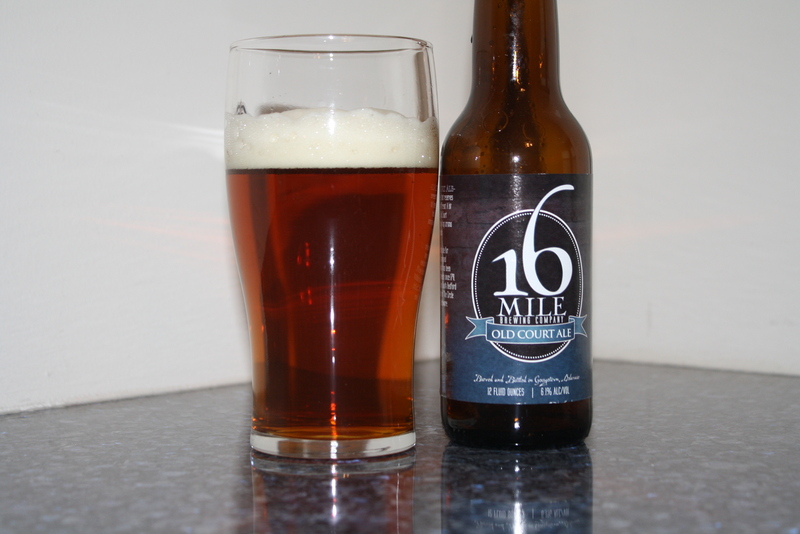 16 Mile, a brewer in Georgetown, DE takes its name from an old nickname for the area that was so centrally located that it was said to be “16 miles from anywhere” in the state. The brewery’s owners, Brett McCrea (with a background in counter terrorism) and Chad Campbell (with a background in banking, real estate and teaching science) decided to leave their careers in the DC area and return to Sussex County. They had reasoned that it was the perfect place to raise their families and embark on a second act (what G-LO likes to call Life 2.0) that would capitalize on their somewhat unique experience and provide an outlet for their passion for great beer. An American ale that reserves its right to be different. A bit lighter in body, Old Court provides a citrusy hop aroma and caramel finish. Appearance: Amber with lots of foam and lacing. Aroma: Sweet malt, a little hoppy with a hint of pine. Taste: Well carbonated and crisp with a smooth, if slightly bitter finish. This was an easy drinking beer. For a first taste, I am left with a hankering to want to try more of their offerings. Good beer for sure. They were the sponsor of a 10k I just ran in Bethany Beach, DE. Beer drinker and road runner. Is one used to counteract the other? VG Liquors, huh? Been by there a million times, but never thought to pull in. Overall, how was the selection? Do you think they’re doing enough business in the craft beers to keep the stock rotating? I was over at Home Depot so I stopped at VG. Not sure if you would like the selection. Not a lot of craft beer (certainly not when compared to Victor Liquors on the other side of the road). I was stunned to see the selection of cans … PBR, Piels, Schmidts, Schaefer, Genesee Cream, Carling’s Balck Label. You would have thought I stepped into a time machine.